With decades of experience responding to disasters, we know that international emergency relief operations are often marked by chaos. Hungry and anxious communities line up in need of food and other critical items. People are panicked and distressed. The following blog is adapted from the original version by ActionAid Kenya. ActionAid is responding to the Horn of Africa drought crisis in Kenya, Ethiopia and Somaliland. In Oldonyiro Nyiro, Kenya, where ActionAid was distributing emergency relief items, the situation is calm and organised. Bags and boxes of food and other critical items like women’s dignity kits are piled up next to tarpaulins and drums of water. Local women have it under control. “These women know one another, every family situation and they look after one another,” says Lurija Lesuuda, ActionAid staff member helping to coordinate at the distribution centre. The women talk to each other and it is the women collecting emergency items. It’s a feedback loop in process – as they collect information on what local families are being affected by and what they need most urgently. The process starts with the formation of a Disaster Management Committee at the community level, whose members are elected. This is a women-led entity and its roles include identifying the community’s immediate and long-term needs and the most vulnerable community members. In our experience, women are almost always the first responders in emergencies. In the current drought in the Horn of Africa, women shoulder the heaviest burden in caring for their families and communities. Many women are travelling long distances in search of water and sustenance for their children. They also face an increased risk of gender-based violence. At the distribution centre, there are notices put up to show what each community member is entitled to take back to their families. Women from the Disaster Management Committee sign for deliveries of emergency supplies and organise the crowd gathering according to the villages where they come from. The supplies are distributed calmly and carefully and, after some chatting, the crowd dissipates. 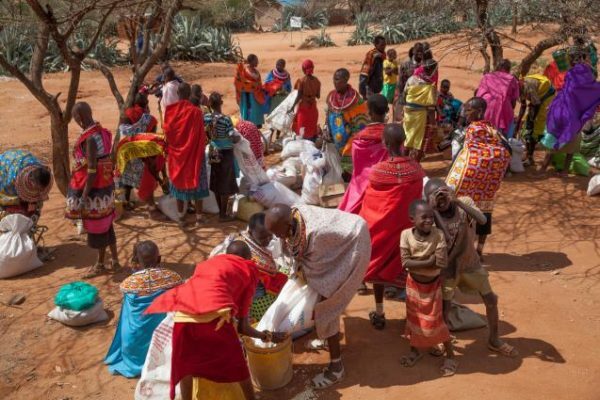 Traditionally, Samburu and Turkana women in this region of Kenya are not treated equally to men. They are excluded from most decision-making, from the household to the community level. By taking charge of the emergency response, women in remote Kenyan communities are building their leadership skills, they are learning to speak up for themselves and standing up for their rights. For these women, and men, it’s the beginning of change in their communities. And we are proud to be part of it.